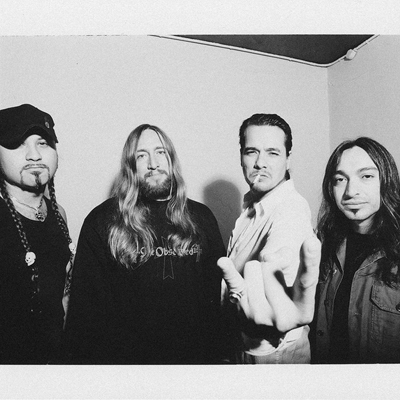 Unida – one of two projects (along with Slo Burn) involving desert rock icon, vocalist John Garcia (Kyuss) started in 1996-7 following the breakup of Kyuss. Originally called “13”, the band featured the dynamic heavy metal guitar work of Arthur Seay (HOBP) and flashy hard rock rhythmic structures that are the signature style of drummer Mike Cancino (HOBP). Bassist Dave Dinsmore, (formerly of Bl’ast, pre-Nick Oliveri, currently with Brant Bjork’s Low Desert Punk) was the first of 4 bass players that would fill the position. The heavy metal jams the band created were pushed in different directions by each subsequent bassist. After Dinsmore left the group, Scott Reeder (The Obsessed, Kyuss, Sun & Sail Club) took over, followed by Eddie Patencia (HOPB) and then Paul Gray of Slipknot. They were featured on Side “B” of a split with Swedish Stoner rock band Dozer, an EP called, “The Best of Wayne – Gro”. They subsequently recorded 2 full lengths. 1 on the now defunct Man’s Ruin label, “Coping With The Urban Coyote”, and a self released album “For The working Man”. Unida is still known to come together for an occasional show or mini-tour of Europe.